Valentines day décor does not have to be an overkill of reds and pinks! I love decorating for all the holidays, but Valentines Day is a little more difficult, in my opinion. I don’t want my house to look like someone came in and just threw a bunch of tacky red and pink plastic and foil decorations everywhere. Ya know? So since this is the first mantel I have EVER been able to decorate, I was pumped to set up this little space. I wanted a more natural/rustic feel without being too farmhouse. I also didn’t want it too be too “Springy” because we still have 2 feet of snow on the ground here and will for a few more months at least! Valentines décor doesn’t have to look like Spring. Our fireplace is not a regular full-size, so that was the other challenge I faced. I originally found these adorable lanterns but they were too large for the mantel. The first DIY was the focal piece. I went to my local thrift shop and found this lovely eagle photograph that Liam (my son) was giggling at as I put it in my cart. I ditched the eagle and used this perfect wood frame to make a simple photograph display. Look for frames that are real wood, and without a varnish, shiny topcoat etc. This frame was stained wood but didn’t have a shiny and smooth finish, perfect for that distressed look. Take the photo, glass and backing out from the frame. Using plyers, take the staples out from both the vertical sides. (or vise versa if you want the frame displayed vertical instead of horizontal) If your frame does not have staples to hold the backing in, you can use a staple gun to make your own! Wipe down your frame with a cloth to get any dust or dirt off. Using a paint brush, paint very light strokes of white (or any color) to achieve a worn rustic look. You can also paint the whole frame and then use sandpaper to distress it! Once dry, I tied a piece of twine to one end of the staple to the other, making it as taught as possible. This will be wear you hang your photos from, so make sure the knot is tight! I used mini fabric clothespins to hold some small photos. You can find these in the bullseye section of Target sometimes and at Michaels Craft Store or Joanns Fabric Store. Use washi tape to make cute clothespins in whatever color and pattern you like! Our next DIY is even easier! I found this wood heart for $3 in the bullseye section of Target. They have a similar one at the Dollar Tree as well. Since there were already perfect sections/lines on this piece, I painted it ombre starting with the darker color on the bottom. I only used two colors here, a light pink paint and then a white. I started off with the pink color as-is for the bottom section then kept adding more and more white paint as I went up! See? SO EASY! The last DIY is the wood heart banner. I found this at the Dollar Tree for a buck and knew I wanted to make something out of it! I took it apart by using plyers to pull the staples out. I flipped them over so the blank side was up and painted them black. After the coat of black dried, I painted them using a similar technique as the frame. I just did light strokes and chose a matte light grey color. After they dried I flipped them over and hot glued them along a long piece of twine. Easy peasy! Everything pictured was super affordable! This candle holder and candle were thrifted for less than $5 total. The faux little succulent was from Target for I believe $3. I wrapped battery-operated twinkle lights around the frame and then fed the end of it into this little twig ball. I use these all over the house for décor and bought them on clearance from Target years ago. Here is a similar vase filler. 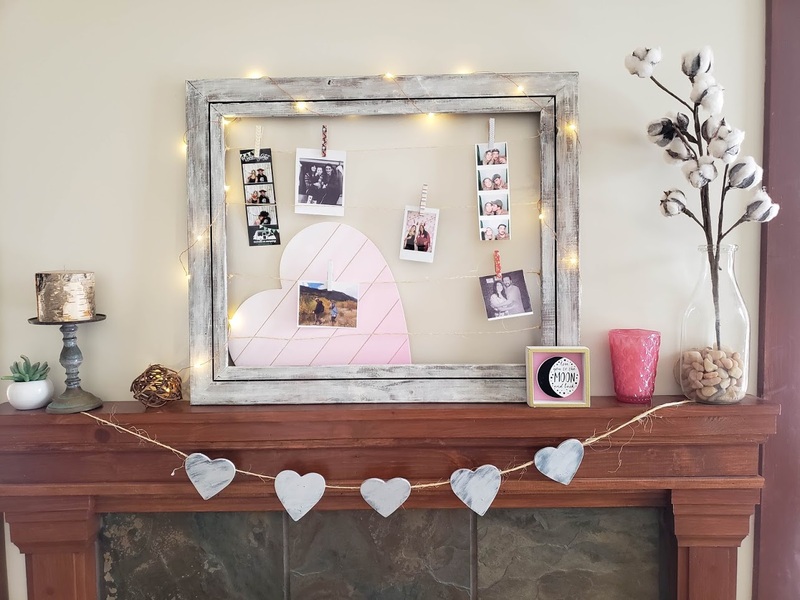 I hope this post gave you some ideas on how to decorate your own mantel and I would love to know how you decorate your home for valentines day! awwwwww this is very sweet, pictures, pink candle holder, and heart garland, check, check, check love it! i’m gonna put mine up early. Aww it’s so cute! I love the little lights! So cute! I can’t believe it’s almost time for Valentine’s Day already. I love the understated elegance of this mantle. The pink and gray color combo is one of my favorites. This looks so super cute! I love the garland!